Mike is a partner and trial lawyer in the firm with extensive jury trial experience in state and federal courts. Mike’s practice has been somewhat unique in that while he has considerable jury trial experience, he also has extensive bench trial experience in the area of matrimonial law. Accordingly, his experience and expertise extends to a wide range of civil disputes, such as medical malpractice, complex commercial cases, product liability claims, personal injury actions, wrongful death claims and complex divorce litigation, including disputes involving substantial marital estates and custody litigation. Mike began his active law practice in St. Joseph, Mo., in 1982. In 1989, at the age of 35, Mike was the recipient of the Lon O. Hocker Memorial Trial Lawyer Award. This award is given annually by The Missouri Bar Foundation to select trial attorneys who have demonstrated unusual proficiency in the art of trial advocacy. In 1994, at the age of 40, he was inducted as a Fellow of the American Academy of Matrimonial Lawyers, recognizing outstanding trial lawyers in the area of matrimonial law in the United States. In 2000, for his successful representation of plaintiffs, Mike was certified as a member of The Million Dollar Advocates Forum. Membership is limited to attorneys who have demonstrated excellence in advocacy, and who have won million and multi-million dollar verdicts, awards, and settlements. Since 2007, Mike has been selected for the “Super Lawyer” in Missouri and Kansas publication. In 2011, Mike was named to the “National Trial Lawyers” Top 100 Trial Lawyers. Mike has been designated a life member of the national registry of Who’s Who and is a member of the St. Joseph, Mo., and American Bar Associations. In 2013, Mike was certified as a member of the Multi-Million Dollar Advocates Forum. Mike is also a “Preeminent AV” rated attorney indicating the highest level of skill and integrity. Conferred the Lon O. Hocker Memorial Trial Lawyer Award presented annually to select attorneys by the Missouri Bar Foundation to young lawyers who have demonstrated unusual proficiency in the art of trial advocacy. The National Trial Lawyers- Top 100 Trial Lawyers. The National Trial Lawyers is an organization composed of top trial lawyers from each state. Membership is obtained through special invitation and is extended only to those attorneys who exemplify superior qualifications of leadership, reputation, influence, stature and profile as civil litigators. Selected for inclusion in Missouri/Kansas Super Lawyers editions 2007, 2008, 2009, 2010, 2011, 2012, 2013, 2014 and 2015. No more than 5 percent of lawyers in the state are selected by Super Lawyers. Member – Million Dollar Advocates Forum & Multi-Million Dollar Advocates Forum (membership limited to trial attorneys who have demonstrated exceptional skill, experience, and excellence in advocacy by achieving a trial verdict, award or settlement in the amount of one million dollars or more). Mike is admitted to practice law in Missouri state and federal courts and has been so since 1982. He is also admitted to practice in Kansas federal courts. He has been admitted to practice before numerous other United States District Courts around the country, including Wyoming and Wisconsin. He was admitted to practice before the United States Court of Appeals for the 10th Circuit in 1986; the United States Court of Appeals for the 8th Circuit in 1987; the United States Supreme Court in 1999 and the United States Court of Claims in 2013. Mike graduated from Kansas City Kansas Community College, receiving an Associates degree in political science and sociology in 1977. Thereafter, he received his bachelor’s degree from the University of Kansas with a double major in political science and sociology in 1979. Mike received his J.D. from the University of Kansas School of Law in 1982. Mike was a law clerk to the 29th Judicial District Court of Kansas from 1981 to 1982. Mike began his active law practice in St. Joseph, Mo., in 1982 with a local firm. He, thereafter, became an equity partner in that firm in 1986. In 2002, Mike, along with R. Edward Murphy, Joseph Elliott, and Kenneth Siemens, founded the law firm of Murphy, Taylor, Siemens & Elliott P.C. Mike has participated as a speaker in educational seminars nation-wide for various professional organizations, including the Missouri Bar. He has presented to groups which have included attorneys, judges, medical doctors, nurses, physical and occupational therapists, psychiatrists, psychologists, mental health professionals, corporate personnel, human resource directors and the general public. As a speaker, he has presented on such issues as trial tactics, evidence, discovery, expert witnesses, ethics, tax considerations, employment law and other timely and relevant topics. Mike is the author of Chapter 18, entitled “Trial Practice” of the Missouri BAR’s Family Law Seventh Edition and Chapter 19, entitled “Discovery” of the same publication. Mike also serves as a reviewer for the Missouri Bar of proposed CLE desktop chapter material. Mike served as an instructor at Missouri Western State College from 1985 – 1994, teaching classes in Tort Law, Litigation – Practices and Procedures and Business Organizations. Mike was born November 2, 1954, in Booneville, Mo. He grew up primarily in Blue Springs, Mo., where he attended high school until his senior year when his family moved to Bonner Springs, Kan. He is married, resides in St. Joseph and has three children (two daughters and a son). Mike is a long-standing Sunday School teacher, youth director and director of Vacation Bible School at churches where he has attended. He is a member of Wyatt Park Baptist Church and presently serves on the church’s governing council. Mike is also a contributor to St. Joseph Young Life and has been extremely active in other youth activities, including coaching his children in St. Joseph boys baseball and girls basketball. Mike is a graduate of Leadership St. Joseph 1983. He was co-chairman of Leadership Tomorrow, an advanced leadership training program for select St. Joseph high school students. In 1985, Mike was the recipient of the Volunteer Award of Recognition for Outstanding Volunteer Services to the St. Joseph Community. He has been very active in other civic organizations, including various fund drives for community groups and has served as a member of the United Way Allocations Committee, the Board of Directors of the Midland Empire Diabetes Association and Dual Ministry, Inc.
We offer a completely free case evaluation for personal injury and workers’ compensation cases. 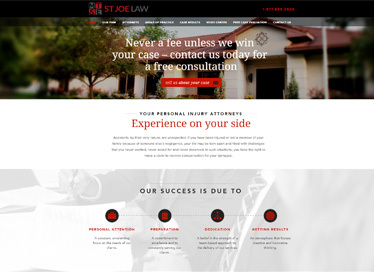 * Free case evaulation offer does not apply to other types of cases we handle. Murphy, Taylor, Siemens & Elliott P.C.